Located in a former gas station-turned-carwash just a few blocks north of the storied Oxford Square, Canteen is the perfect pit stop for breakfast, lunch or dinner. 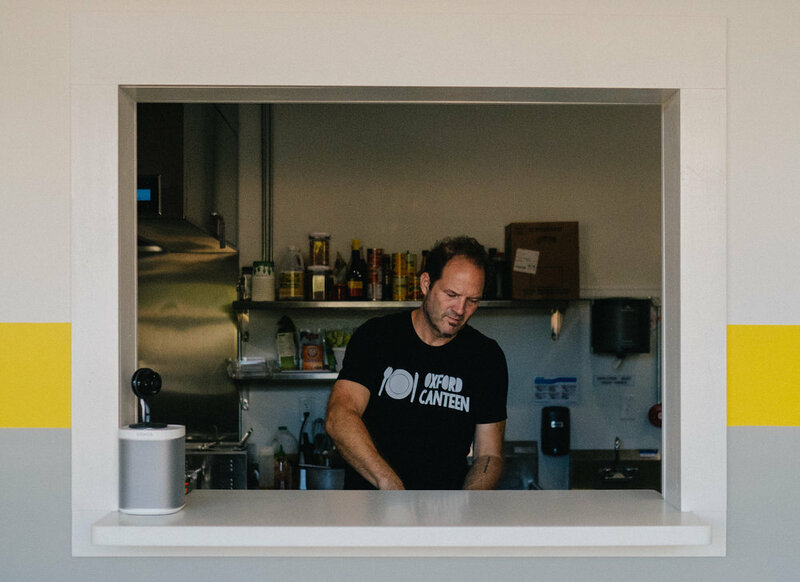 With an all-day menu served from 8am-8pm, you can pick up a Lulu's Vietnamese-style iced coffee and some breakfast tacos on your way to work, or meet friends to enjoy a glass of wine or house cocktail with dinner. Make sure to follow us on Instagram for the ‘Soup of the Moment’ and farmers market-inspired daily specials as well. USA Today, "Mississippi’s foodie gem Oxford lures hungry visitors"
The Daily Mississippian, "Canteen’s constantly changing menu offers fresh ingredients with a twist"
Chef Corbin Evans opened the first iteration of Oxford Canteen in 2014 in an alley by the Lyric Theater. From its tiny kitchen and walk-up order window, Evans served some of the dishes that have since become local classics and are now available at the new Canteen: a beef brisket grilled cheese with Sriracha mayonnaise, a vegetarian “dirty grains” packed with roasted vegetables, and Oxford’s best breakfast tacos. Chef Evans has lived and cooked in Kansas, Philadelphia, Paris, and several points in between, but his primary influences in the kitchen come from the nine years he spent in New Orleans, where he learned to make food for people who make an art form of eating well. Oxford Canteen is proud to be part of a community that is committed to local and sustainable agriculture. For us, that includes serving sweet potatoes from Calhoun County Farms; eggs from Pea Ridge Farms; Mississippi black rice from Two Brooks Farm; brown rice and grits from Delta Blues Rice; produce from Yokna Bottoms Farm, Native Son Farm, and Clear Creek Produce; and meats and seafood from Home Place Pastures and Evans Meat. We are also proud to be the only restaurant in Mississippi to serve High Walk coffee from Congregation Coffee from New Orleans.